Sunday December 12th 1920 Perfectly fine day. Hattie to church and Cora to town awhile. Ott & Fannie were here for dinner and then we all rode awhile. Took Ott to the train for Des Moines. I was at Wills grave for a moment before Hattie and I were brought home. Fannie at The Hospital till supper time. She stayed here all night. Wills & Ediths burial day. 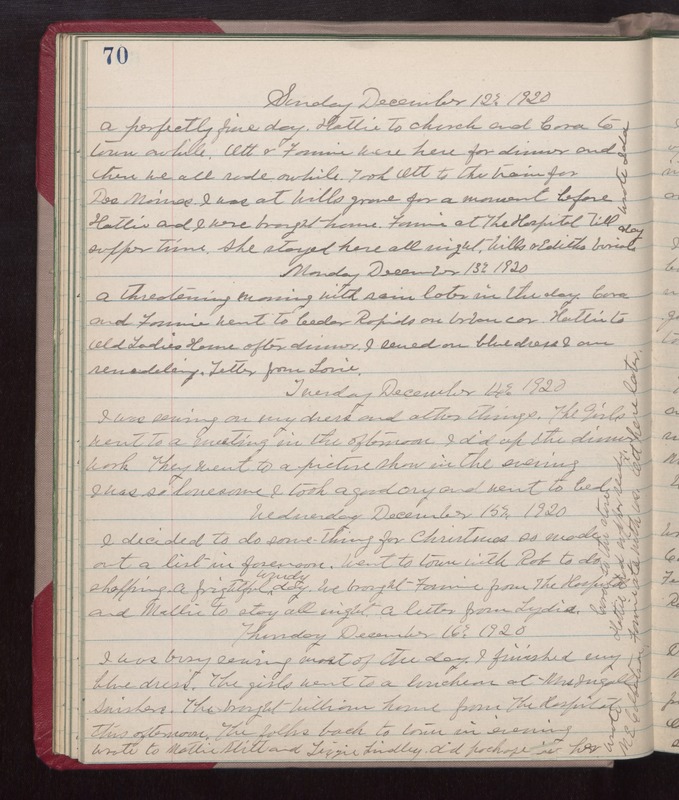 Wrote Ida Monday December 13th 1920 A threatening morning with rain later in the day. Cora and Fannie went to Cedar Rapids on Urban car. Hattie to Old Ladies Home after dinner. I sewed on blue dress I am remodeling. Letter from Lorie. Tuesday December 14th 1920 I was sewing on my dress and other things. The Girls went to a meeting in the afternoon. I did up the dinner work. They went to a picture show in the evening. I was so lonesome I took a good cry and went to bed. Wednesday December 15th 1920 I decided to so some thing for Christmas so made out a list in forenoon. Went to town with Rob to do shopping. A frightful windy day. We brought Fannie from The Hospital and Mollie to stay all night. A letter from Lydia. Cora to the store. Hattie had supper ready. Fannie ate with us. Ott here later. Thursday December 16th 1920 I was busy sewing most of the day. I finished my blue dress. The girls went to a luncheon at Mrs Ingall Swishers. They brought William home from The Hospital this afternoon. The folks back to town in evening. Wrote to Mattie Stitt and Lizzie Lindley. Did package for her. wrote M E Culbertson.